The excellent weather we had Sunday night gave no indication that Monday would start off cool and breezy with a slow, steady rain. After breakfast we packed up the tent and supplies in the rain and drove over to the Pierce Stocking loop. The loop is named for the man who first conceived the idea of creating the scenic drive. Pierce Stocking spent part of his life as a lumberman in Michigan. He loved the bluffs and the other areas around the Sleeping Bear Dunes and often spent his spare time in the forests learning about nature. He decided that others should be able to view and enjoy this area of Michigan as much as he did so he came up with a plan to build a scenic drive through the area. 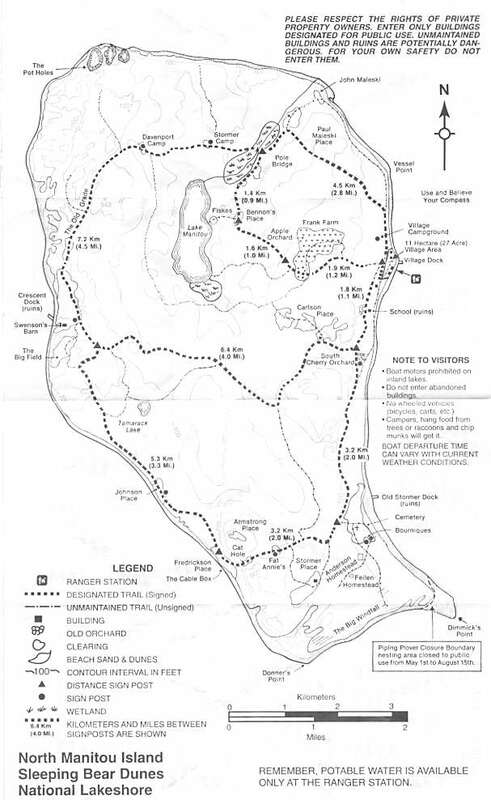 The Pierce Stocking scenic loop is a self-guided vehicle tour through part of the Sleeping Bear Dunes National Lakeshore. The loop is roughly 7.4 miles long and is situated between Lake Michigan, Glen Lake and North Bar Lake. There are pamphlets available to visitors at the beginning of the tour which explain something about each of the 12 points of interest along the drive. We stopped at several points of interest along the way and hiked out to the planked dune overlook for a few pictures. It was extremely windy at the dune overlook and I felt as though I was in the middle of a dust storm in the desert because of the large amount of sand being blown through the air. A long time ago a mother bear and her two cubs were forced to flee from a devastating forest fire in the land that is now Wisconsin. Their escape forced them to swim across Lake Michigan to the land on the other side. The cubs swam bravely for quite a distance, but eventually the struggle became too much. The cubs fell farther and farther behind the mother bear and eventually slipped below the water and died. When the mother bear reached the shore on Michigan's side she climbed to the top of a bluff and looked out over Lake Michigan for her cubs. Since she was not able to find them the 'great spirit' looked upon her with pity. He brought the North and South Manitou Islands up from the lake to mark the locations where her cubs disappeared and laid the mother bear to sleep on the bluff. While at the interpretive center we spoke with an employee about the location of the Werner Cemetery. Fortunately he knew exactly what we were talking about. He drew us a rough map of the surrounding area and explained how to find the cemetery. We left the interpretive center and headed back to Port Oneida. It turns out we were in the right area the first time but were looking on the wrong side of the road. We walked down a small path into the woods and a few hundred yards later we were at the cemetery. It was a small, fenced-in area only several feet away from the edge of a tree-covered bluff overlooking Lake Michigan. A path ran north and south along the edge of the bluff only 10-15 feet from the cemetery. If someone was walking down the path and not paying close attention they could easily pass up the cemetery because it blends into the surroundings so well. It was quite a surreal feeling to be standing in the middle of this cemetery, dating back to the mid 1800's and listening to the muffled sound of waves crashing on the shore far below while the strong wind whistled through the branches and leaves above us. Although this was 2002, the sounds and sights were probably not much different than they were back in the mid 1800's when the first person was buried here. There were several large tombstones and quite a few small, rather plain stones. Some were still very easy to read while others were difficult to decipher due to years of weathering and algae growth. I was able to make out the names of a couple of the Werner family members from their tombstones. It was obvious that someone still visits the cemetery because there was several fresh flower arrangements placed by a couple of the tombstones. We took a few pictures here and continued north on the trail and eventually came to a clearing that overlooked Lake Michigan and the open farmlands to the north and east. There was not much else to see from here so we hiked back to the van and drove to a local party store for some subs. After lunch we drove to Pyramid point. The trail from the parking lot to the sandy bluff at the top is about one mile long and is an uphill hike the entire way. It starts out by cutting through an open grassy field before it enters the trees. It was rather tiring in the afternoon heat and we stopped for a couple short breaks on the way up. When we finally made it to the top we had a very nice panoramic view of Lake Michigan and North Manitou Island in the distance. After a few pictures we were ready for the easy, downhill hike back to the parking lot. The afternoon was now turning into the early evening so we decided to drive to Traverse City where we stayed overnight at the campground before heading home the following morning.